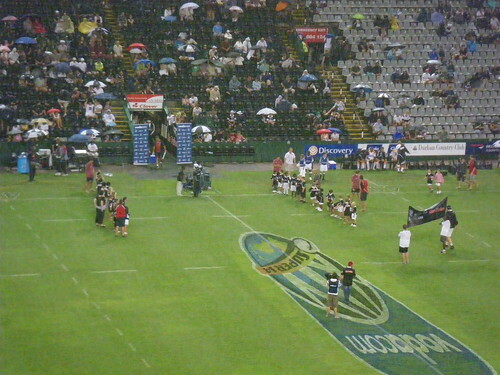 Opening game of the season, the Sharks of Durban taking on the Chiefs of….New Zealand? The game opened up as a rather boring game with each team kicking the ball back and fourth and back and fourth…it actually seemed as though we were watching a soccer match. The reason for all the kicking was that it was pouring and kicking in the rain is easier than catching and throwing the ball. No one could make it to the end zone instead kicking it through the uprights on penalties twice each, leaving the score at an even 6-6 at halftime. The stadium was pretty similar to any NFL stadium. Perhaps a bit smaller, and with a much lower ticket price, it was every bit as enjoyable. The food for sale was generally the same, plenty of beer on tap, but men walking around with biltong instead of cotton candy. The stadium was in the shadow of the new world cup soccer stadium across the way, and there were jerseys for sale in the stadium shop. After the half the game was very different with each team running and rucking the ball. 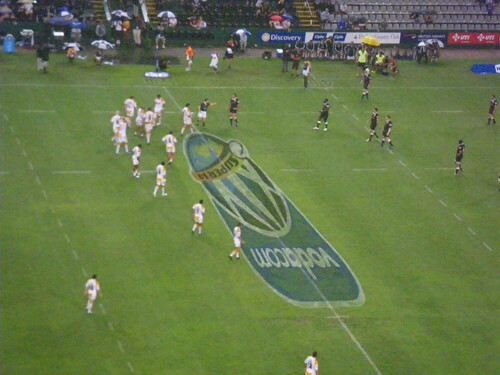 The sharks never made it into the try zone but managed to kick three more times making the 15 – 6. 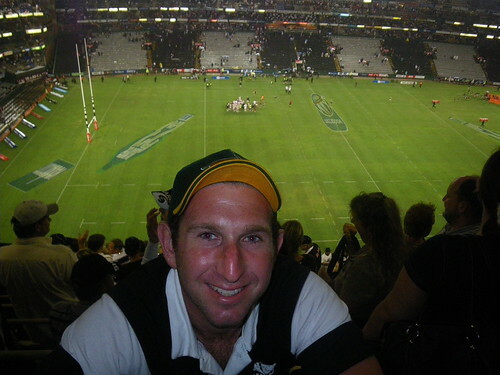 Then a break-away and suddenly the Chiefs were threatening to put a try on the board, the Sharks held though and kept holding, eventually kicking the ball away in what could be described as a brilliant goal-line defense. Eventually though, there was another break-away and before we knew it the Chiefs had scored their try, made their conversion, and were leading by one point with 2 minutes remaining on the clock.